Primaries or caucuses will be held for one or both parties in 24 states (Alabama, Alaska, Arizona, Arkansas, California, Colorado, Connecticut, Delaware, Georgia, Idaho, Illinois, Kansas, Massachusetts, Minnesota. Missouri, Montana, New Jersey, New Mexico, New York, North Dakota, Oklahoma, Tennessee, Utah and West Virginia), plus the Democrats Abroad primary for the 6 million Americans living overseas. 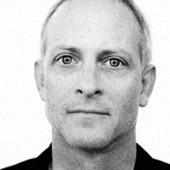 And, again, we want to thank The New York Times and AIGA for their support of this initiative in citizen journalism. DC (among others) votes next week. Pix wanted from here also? I posted my photos, then discovered later that taking photos in the polling places is illegal in Florida. I suppose I understand some of the rationale, but at the same time given the irregularities we've experienced here over the years a completely transparent voting process should be welcomed. Greg, yes, voters in states with primaries or caucuses after Super Tuesday can certainly participate in this project. In the next week after Tuesday, there are nine more contests. Join in. 02/12 District of Columbia, Maryland, Virginia. The Polling Place Photo Project has a full list of all the primaries and caucuses on its homepage. I'm a New Yorker who just voted. I left my camera home (an SLR) because I anticipated the intimidation at the polling place and didn't want anything to prevent me from actually voting. How do I find out what is and what is not permissible in terms of photographing my local polling places short of asking the police on duty? 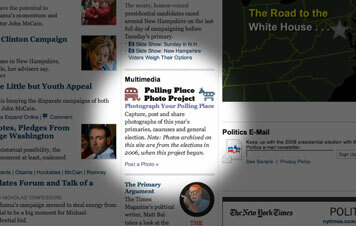 And the Polling Place Photo Project is co-sponsored by the New York Times, isn't it? I (sort of) understand not being about to inform its readers about related election laws of all 50 states, but not even of its namesake? Here in Pennsylvania our primary is April 22nd. To my knowledge taking photographs is allowed and I'm going to bring my camera. Greetings from Paris. I'm enjoying this great blog....Clearly the sentiment from Paris very positive re: the election. Long lines were at the American Church for those voting in primary states. I've met very few Republicans here. As for photos, I saw that link on the NYT site and wondered if taking photos was in fact legal. I'm not sure what the photos reveal anyway, but I was glad the turnout throughout the US was very strong. It's the most positive sign that Americans are not asleep. On another note, re: the blog, I’m working in a smaller way with advertising, promoting here in Paris a printed ad and book idea that is quite old : the one page book. People can save money and paper and ink by printing on a single side of an A4 or A3 sheet, fold the little guy into an 8 page book. If you would take a look and let me know what you think about this, I’d very very appreciative. Namely, it is difficult to find at the site more than general suggestions to check your own state's laws before going ahead and snapping shots. So in my case, I didn't take my 10 mp Lumix to the polls, though I was reasonably sure it was legal in New York, I needed the ammunition to back it up and didn't have all day to do amateur legal research. The project remains a solid, interesting idea. Regarding comments above about the laws governing photography of polling places, there is no one answer across the 50 states. And personal experience during the 2006 election also confirmed that even where a state has clear rules or laws, that local polling officials often make their own rules -- which need to be followed unless one is willing to risk being evicted or arrested or having your camera confiscated (which almost happened in Florida last week with a participant). In the absence of a published resource that outlined the rules state by state, district by district, it was my decision to encourage all voters to ascertain the rules within their own areas. I'm sorry we could not have been more helpful under the circumstances. I don't understand the purpose. If it's encouraging people to vote, the photos came a little late. And the people that would take the time to photograph were probably going to vote anyway.